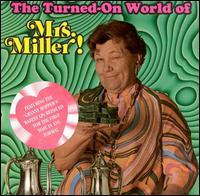 Loungecore novelty queen/middle-aged housewife gets all three of her late '60s albums -- Mrs. Miller Does Her Thing, Will Success Spoil Mrs. Miller,? !, and The Country Soul Of Mrs. Miller -- on one disc. Unintentionally humorous/horrifying at the same time, and including such hip hits of the day as "Up Up And Away," "Monday, Monday," "Memphis," and "Act Naturally."